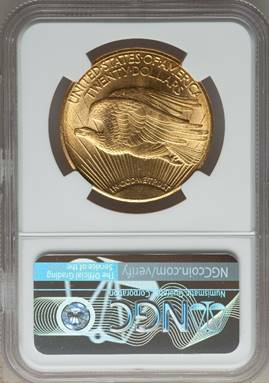 The 1925-S double eagle was spared from complete eradication during the mid-1930s gold melts by trade exportation, which preserved small quantities in South American and other foreign banks until recent decades. Although several hundred thousand pieces were paid out to Federal Reserve Banks, per Roger Burdette, the small surviving population of this date does not suggest that any large quantities ever made it into public hands domestically. The date is scarce across the Mint State spectrum, and its availability declines sharply in MS64. Gems, although in existence, are far out of reach for all but the most financially backed collectors. The NGC population stands at just 1 with 4 higher. 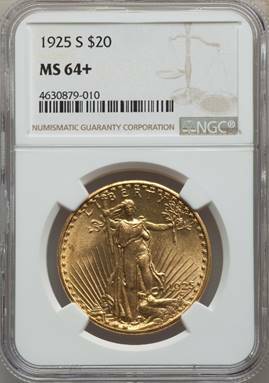 Listed at $65,000 in the NGC price guide.